All body condition scoring is conducted independently by highly trained assessors. The on farm team respond to the data based on farm policy of any cows nearing 4 BCS go onto OAD and are preferentially fed to ensure they reach BCS 4.5 by PSM and hold that through to drying off. This is our year round policy to manage BCS for all cows. On farm staff will take animals out of the OAD herd based on their own observations and if any doubt arises the animals will remain on OAD until the next whole herd BCS from the independent assessors. The latest on farm assessment was completed, below are the results using Minda Online. Overall the average was lower than we expected (one of the benefits of using independent assesors) with more below BCS 4 than we thought. As per our year round policy, cows that are not at 4 have been placed on once a day (OAD) and are being preferentially fed. Another whole herd BCS has been planned for towards the end of April so that we still have time to react should the current course of action not be suitable. SDF targets ALL cows to be at BCS 4.5 at dry off rather than a herd average. In recent Southland Demonstration Farm Focus days a number of questions and conversation have been brought up about BCS gain / loss and walk over weighting as a BCS measure. Below is a response based on NZ Science and Research by John Roche, Jane Kay and Dawn Dalley from Dairy NZ. Not every cow will be weighed at every milking (I have yet to come across a system that gets 100% of cows- except maybe with robotic milking) so there could be some random changes just due to which cows are making up the average. Gut fill has a large impact on liveweight – hence the recommendation in growth rate trials that animals are stood off feed overnight to empty the rumen. There could be up to 40 kg difference in cow liveweight from immediately post milking to 3-4 hours after milking hence why the herd average is normally higher at the pm milking compared with the am milking. The value of individual cow weights can be in identifying individual animals that are sick/off feed by setting an alert that pulls out any cow that drops more than x kg in liveweight from the previous measure or 7 day average which is more accurate. Lwt change is a poor representation of BCS change. That is why BCS was developed. Although a BCS unit is approx. 31 kg Lwt, Lwt only explains 30% of change in BCS (so they can change by different amounts or go different directions sometimes). In addition, as BCS is a non-continuous scale, while Lwt is a continuous scale, short term changes cannot be equated in the way people are currently. The latest trial that John Roche ran as part of the transition cow programme showed no difference at all in production or BCS loss post calving when cows gained weight quickly vs slowly pre-calving (See attached graphs). Cows were fed during late lactation to gain body condition and then maintained (small amount of gain) through the dry period compared with cows that had to gain all weight quicker during the dry period. 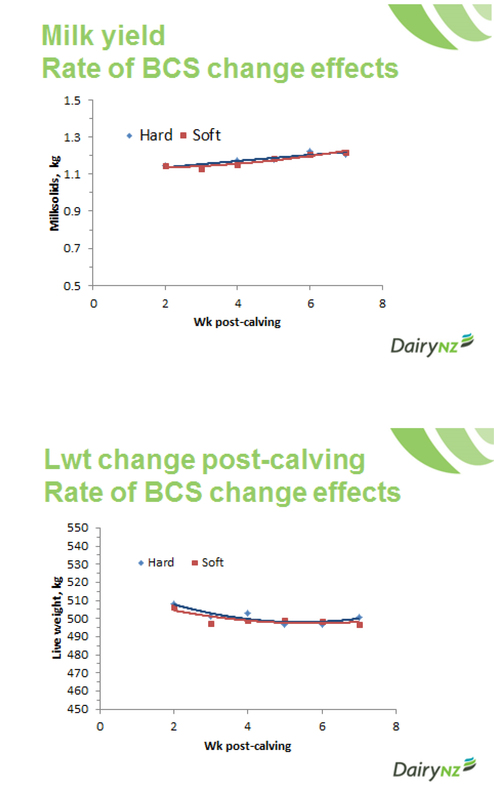 The research would suggest no difference in BCS loss post-calving with ‘Rapid’ (soft) vs ‘Slow’ (hard) BCS gain, in fact blood NEFA in early lactation was greater in cows that gained BCS slowly (hard) than those that gained very quickly post-drying off. This would indicate that BCS loss was, in fact, greater in the hard cows (slow BCS gain) – the exact opposite to the dogma being proposed by some.